On June 6, 1968, at the age of 42 and at the height of his popularity, Robert F. Kennedy was tragically assassinated. Presidential candidate, U.S. Senator, father—Kennedy was all of these things—and, to many Americans, he embodied the power of possibility and positive change during a period of social unrest, racial inequality, and war. Renowned Life photographer Bill Eppridge followed and photographed Kennedy during his early campaign days up to his untimely death, and A Time It Was features dynamic images of the public Kennedy, as well as rare, intimate ones, many of which have never before been published. 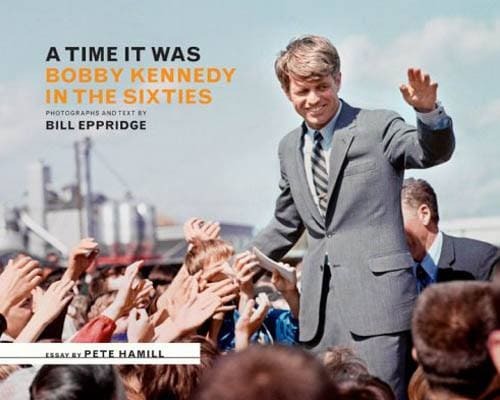 An essay by Pete Hamill places the events in historical context, while Eppridge shares his insider’s perspective on Kennedy. Released to commemorate the fortieth anniversary of Kennedy’s death, A Time It Was reveals why the memory and legacy of Kennedy and his dreams continue to be relevant today.